Construction contracting is becoming increasingly complex and litigious. Owners are reacting with 500-page or more contracts which attempt to place all responsibility on the contractor. Contractors are reacting with pages and pages of exceptions and classifications to the terms and conditions. Construction contracting has never been a simple business, but over the past 20 years it has become even more difficult as owners and contractors have had to rely more upon legalistic maneuvering to attempt to control risks. Along with more complex contracts comes increased opportunities for contractual disputes. Most construction contracts today contain some form of Alternative Dispute Resolution (ADR): a contractual means to resolve disputes without going into the classic courtroom setting. By far, the most common form of ADR is arbitration. While arbitration is a valuable contract dispute resolution method, it is not a panacea. Contrary to common belief, arbitration is not always less costly than litigation; and, there are serious drawbacks for this form of dispute resolution. For one, it does not necessarily eliminate discovery (the costly procedure whereby the disputants must make all of their documentation available for review and copy). Additionally, under arbitration, there is no provision to appeal a "bad decision' and the process can be very expensive. Given the less than perfect arbitration ADR process, owners and contractors are looking for something better -- a process where the disputants (rather than the lawyers) maintain control of the process, the costs and the outcome. Mediation, a here-to-fore little explored alternative dispute resolution technique is growing in popularity. Mediation has shown some impressive results. Over 80% of the disputes that are voluntarily submitted to mediation are satisfactorily resolved. And, even for court-referred mediations, over 50% are settled satisfactorily without burdening the court system. Yet, few people fully understand the process. Mediation is a voluntary process in which all parties to a dispute work with an impartial mediator who assists them in finding ways to resolve their conflict. Different than litigation or arbitration, mediation is not a win/lose determination. A skilled mediator facilitates a solution to the problem which best fits the needs of both parties; the mediator does not decide who is right and who is wrong. Because mediation is similar to negotiation (except that there is a neutral party guiding the process), it is often referred to as facilitated negotiations. The terms mediation and facilitated negotiations are used interchangeably in this article. The primary benefit of mediation is risk and cost control. Because the parties arrive at the solution (rather than a judge or an arbitration panel making a ruling) the disputants maintain control of the entire process. The chart on the next page illustrates what happens to cost, risks and process control as disagreements escalate from discussion to negotiation to mediation to arbitration to litigation. Some describe this migration as moving from Peace to all out War. As depicted in the chart, the best solution in terms of cost management and overall control by both parties is discussion. This method of settlement is followed by negotiation and then, historically, with arbitration and/or litigation. [The opportunity to mediate has often been overlooked]. With mediation, a third party neutral is brought in to keep the parties working together rather than turning the problem over to the legal departments. The mediator, acting in a neutral capacity, facilitates continued negotiations by pointing out the benefits of a cooperative settlement vs. a ruling by less informed arbitrators or the courts. The cost of the mediation is usually shared and is nominal by comparison to the classic forms of dispute resolution -- arbitration or litigation. Cost and risk for each party increases exponentially when the dispute crosses the line from a situation where the parties resolve the dispute themselves to a situation where someone else resolves the dispute. Different from arbitration or litigation, in mediation neither party has to lose. Mediation is the method of handling disputes which provides the greatest opportunity for win/win solutions. And, because the parties arrive at the solution, there is a very high probability that the solution will be carried out as agreed. (It is a well-known fact that even with a court-rendered judgments, the losing party may not comply. Its lawyers may file for an appeal which can drag out the final settlement for years.) Historically, disputes that are submitted to voluntary mediation are settled in an acceptable manner and carried out as agreed in the mediation. It should be noted that while mediation is usually a voluntary process, it is common for the results of mediation to be binding. That is, while the parties are not obligated to follow the mediation process to its completion, they frequently agree in advance that if the dispute is resolved, the resolution will be memorialized in a written, enforceable document. Again, history supports that there is a high probability that the agreement that is reached through this voluntary process will be carried out without legal intervention. Mediation is an excellent forum for resolution of construction disputes, contract disagreements, and equity claims. Simply put, any situation that would otherwise be arbitrated, can be mediated. In fact, in most contract disputes the parties could benefit from mediation. Even if the issues are so complex and emotional that arbitration or litigation is inevitable, the issues can be narrowed by first submitting the dispute to mediation. And, it is a little known fact that mediation may be appropriate within a larger litigated matter. Often, parts of a bigger problem in litigation can be separated and more effectively settled through facilitated negotiations. Mediation is not appropriate for points of law or criminal actions or where one of the parties is compelled to 'send a message' to a larger audience. But, in construction disputes the vast majority of disagreements are not over legal issues. More often, the questions at hand are matters of fairness or equity. For example, a delay claim (whether made by the owner or the contractor) is usually not a legal matter. These kinds of claims are characterized as "Requests for Equitable Adjustment" and the actual disagreement is usually over what is equitable (not what is legally correct) for a given situation. The effective mediator has a challenging role. He/she is faced with a situation where the parties may be emotionally charged as the result of protracted, unsuccessful negotiations. One of the first objectives of the mediator has to be to 'de-energize' the situation and get the parties focusing on the real problem and real solutions; not who is at fault. Because the mediation process is non-binding there can be less concern over having the dispute fully detailed before trying to reach an agreement. Therefore, the otherwise necessary months of information gathering by the lawyers can be drastically reduced or eliminated. Meditation is truly more of a businessman's solution to the problem. As such, it can be achieved with less preparation and far less disruption to the businesses and individuals involved. The cost of mediation, ranging from $1,500 to $2,000 per day, that is shared by the disputants. Typically, issues can be mediated in less than a week. Imagine solving a major dispute for less than $5,000 in processing fees. Compare this to the tens of thousands in legal expenses necessary to pursue an arbitrated solution or a court decision, and the need for mediation in construction contracting becomes quite apparent. Arbitration is often characterized as a "split the baby" kind of dispute resolution process and as such it is not uncommon for both parties to be dissatisfied with the outcome. Since a skilled mediator encourages the parties to solve their own problem, each party is more likely to be satisfied with the final resolution of the matter. The point to note is that if an issue can be arbitrated, it can be mediated -- usually faster and at a lower cost to the parties. Since mediation is just beginning to find its place as a tool for contract dispute resolution, it may not be obvious where or how to locate an experienced mediation firm or individual. A word of caution is due here because few states have a required certification program for mediation professionals. Virginia and North Carolina are two states that do provide for certification, but even there, state-certification is optional. Mediation is being looked at as a new business growth opportunity and therefore many organizations and individuals are looking to get in on the ground floor. Not all those offering their services necessarily have the skills required to handle complex construction issues. In choosing a mediator, it is advisable (although not absolutely necessary) to select a firm or individual with specific construction knowledge. Mediation principles are generally the same regardless of what kind of dispute is being handled (construction contract, supply contract or services contract, etc. ), but the terminology is different. An experienced construction mediator does not need to consume time learning construction fundamentals such as the importance of a concrete slump test. Check the Internet. 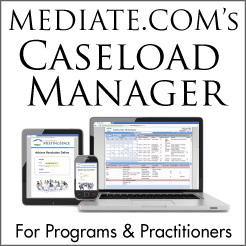 By simply making a keyword search on the term "mediation" or "mediators", a wealth of information will become available including names, addresses, expertise, rate structure and phone numbers of many mediation professionals. A major impediment to increased use of mediation is the need to educate owners, contractors, business persons and contract writers. Due to the very nature of construction work, most standard form contracts contain dispute resolution provisions. Owner contracts also provide a means to resolve disagreements. Unfortunately, both are likely to be in the form of Contracting Officer rulings or arbitration. In order to reap the cost, risk control, time and resource management benefits of mediation it is up to us to push for change. At Adtranz we are incorporating mediation provisions into all of our contract forms as the second level of dispute resolution. (The first level is, and should always be, problem solving through discussion or negotiations). If mediation does not work, we will then consider arbitration or litigation as the situation warrants.